A surgical illustration on The University of Toledo Health Science Campus is gaining some street cred. The surgical wall project by UT medical illustrators Roy Schneider, Tonya Floyd-Bradstock and Joshua Klein is being featured on Street Anatomy, which is a website dedicated to showcasing how anatomy is visualized in art, design and pop culture. The image, which is titled “Wall Repair” and is in Center for Creative Instruction Room 2130, has since been shared around the world on Facebook and Twitter with requests coming in for the UT medical illustrators to replicate the illustration for doctors’ offices. The mural of a surgical wall repair stands 6 feet by 8 feet tall and was created in Trompe l’oeil technique, which is an art style that uses realistic imagery to create the optical illusion that the depicted objects exist in three dimensions, Schneider said. The illustration was installed two years ago. 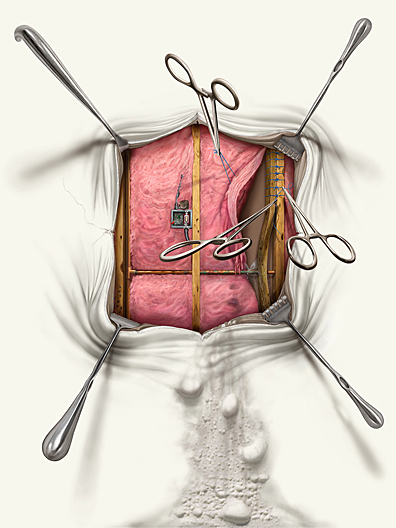 In 2014, it won a first-place award from the Association of Medical Illustrators. The UT piece is in the running for the World Illustration Awards 2015. The founder of Street Anatomy wrote a short story about UT’s illustration. This entry was posted on Friday, September 4th, 2015 at 3:42 am and is filed under Arts, News, UT Health .